The map of the Caribbean Sea and Gulf of Mexico regions is exceptional for its accuracy at this time. 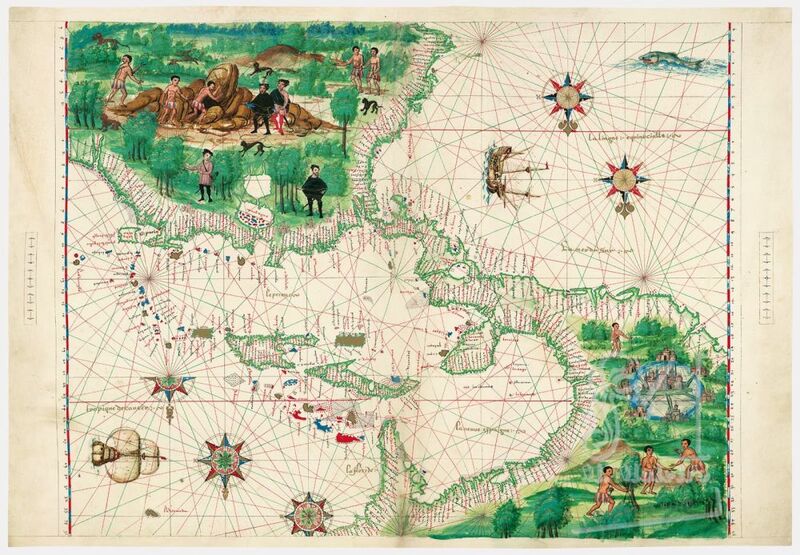 It is reflective of its Iberian cartographic sources, in this case, as exemplified by the northern coast of the Gulf of Mexico and by the Yucatan Peninsula, especially its Spanish forerunners. With its high degree of exactness, as a French map it too proclaims a northern European challenge to the expanding Iberian monopoly in the theater. The orientation and latitude and distance indicators are very similar to those on the previous maps. There is a great fish in the Pacific, and there are compass roses and one ship each in the Pacific and Atlantic. The one in the Pacific is at anchor with its sails lowered and stowed just below the equator, and in the lower left corner, just below the Tropic of Cancer the Atlantic one is under full sail, uniquely and magnificently executed from the rear. Near the top of the map in South America the Andes may be indicated by one mountain, and while the Amazon River is present, typically for the Dieppe school, the Orinoco is not. Europeans (Portuguese or Spanish) are depicted in South America, roughly surrounding a strangely doubled Lake Maracaibo. The Indians in South America are hunting and possibly mining for the Europeans, whereas in North America they may be hunting, and, north of a plainly drawn Mexico City, possibly are engaged in trade with each other. The portrayal of Mexico City here is reminiscent of Hernán Cortés’ published map of Temixtitan (Tenochtitlán) and the Gulf Coast (Nuremberg, 1524). South America also has deer and two varieties of jungle cats.